I find it incredibly boring to drive the exact same car day after day after day. It’s like sitting in a classroom listening to the professor go on and on about the significance of celery stalks in the life of the Cacataibo tribe in Peru. I would do just about anything else, including writing the letter “A” in a notebook a thousand times in a row. In fact, I’d rather put up with the Cacataibo tribe lecture and fill up a notebook with “A”s than keep driving the same car for years on end. Therefore, in order to maintain my own sanity, I’ve decided that I need to frequently switch up what I’m driving. I started doing this about a year and a half ago as soon as I paid off my school loans. During the time that I was slaying all that student debt, I hated my life, and also I kept driving the same car. As soon as I freed myself from that financial burden, I managed to dump on myself a new but far more fun kind of monetary stress—buying and selling used cars. 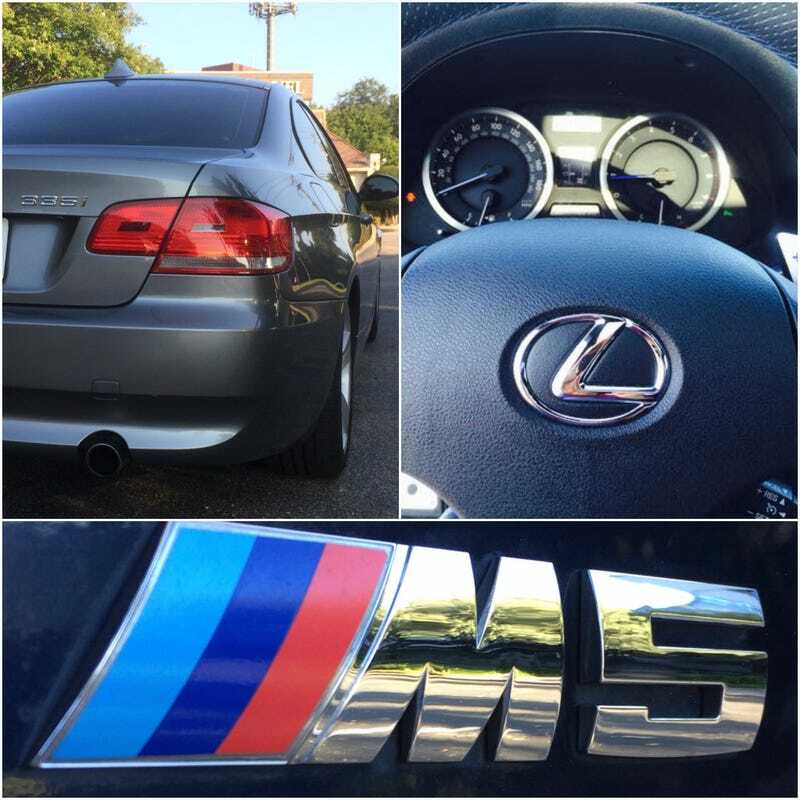 I started off with buying a used 2009 BMW 335i, which I held onto for a few months before getting rid of it and purchasing a 2008 Lexus IS-F. I sold the IS-F after a while, and bought a 2009 BMW M5 which I now own and wrote about it here, in case you missed it. Eventually the M5 will soon be replaced because I have no intention of attending a class about a Peruvian tribe’s love of celery while simultaneously writing one “A” after another on paper. One alternative to buying and selling cars one at a time is to build a collection of cars by going on a car-buying spree. But that route, of course, is very expensive. You have to be rich—and I’m not. But even if I was, I don’t know if I’d want to own a ton of cars. That seems like a huge headache. Maintenance, insurance and explaining to people why you keep buying cars for yourself when you could have a far less expensive and more wholesome hobby, like a coke addiction; it all seems like a stressful way to live. I’d rather just buy, enjoy and sell used cars one at a time so that I don’t have to deal with the nuisances of car ownership. Many people might assume that it’s impossible to fully immerse yourself into exploring your automotive passions while still being financially prudent, but I’m here to tell you that it’s not only possible, I’m doing it! I do end up spending… well, let’s just say some amount of money to buy, own and sell cars, but it’s not an exorbitant amount. The beauty of buying and selling used cars that are seven or eight years old is that you don’t have to put up with massive losses in depreciation each time you sell a car. You can swap out cars frequently without losing much money and the way I see it is that I’m making what I consider a monthly payment to drive different cars every so often. It’s not a real payment like you’d make on a car note; it’s how I budget for these kinds of things. Here’s what I mean. In reality, here is how much it’s really costing me to change out my cars. I paid $17,500 for the car, drove it for three months and then sold it for $18,500. I didn’t make any money on that transaction, since I paid more than what I sold it for after factoring in taxes and other fees. But it still only cost me a little over $250 a month (not including insurance and gas) to own the 335i for a few months. Paying only two hundred something a month for that car was much better than what I was expecting. It felt so good that I proceeded to replicate it with the second car, but, unfortunately I failed. I paid $28,000 (plus ~$1,800 in taxes and fees) for the car and knew right away that I overpaid. I was in a bit of a desperate situation, since I didn’t have another car to drive after I sold the 335i and needed something quick. And we all know how desperation always leads to bad decisions like the time when you bought her a diamond ring when you knew you shouldn’t have. Oops! I figured it would be an interesting choice, with its 416 HP from a robust 5.0-liter V8. I wasn’t planning on getting an IS-F, but it just so happened that I saw it pop up on Craigslist right when I needed a car and it was located a few minutes away from where I live. I test drove it, loved the power and the quick shifts and so I bought it. But when I sold the IS-F eight months later, I only managed to get $25,750. The market for the car just wasn’t as hot as I thought it would be and discovered that the only interested buyers were diehard Lexus fans or folks whose parents loved their Lexuses. I thought I was driving around something highly exciting and desirable, but I was wrong—most enthusiasts don’t really care about a Lexus even if it generates that much power. Additionally, I had to pay for a couple of repairs on a car with no warranty during my time of ownership which came out to about $1,200. Now add that to my buying price of $29,800 and you get $31,000. Since I sold the car for $25,750 after eight months of ownership, I ended up losing $5,250 over that period, meaning that my “monthly payment” ended up being $656.25 to own the Lexus—much more than I was expecting. Also, because the car needed new brakes and tires, I had to sell the car for a lower price than I wanted to which made my “payments” higher. Anyway, I learned three important lessons here: a) warranty is a must b) new or almost-new brakes and tires are a must and c) no one cares about a fast Toyota unless it’s a Supra. I paid $34,000 (plus about $2000 in taxes and fees) for this rare, unmolested version of the M5, complete with brand new front brakes, rotors and almost-new tires. Because the car is in such great condition and has a six-speed manual, I don’t think I’ll have any problems selling it before May 2017, when the warranty is up. If I end up paying around $500 to own this car for the few months that I have it, then I’d be pretty happy. Paying a few hundred a month to drive an M5, an AMG, CTS-V, 911 or (insert your favorite car here) is an excellent use of funds. Think about how many things you might be spending $500 a month on: weekend bar-hopping, clothes-shopping, Costco bulk umbrella shopping if you’re into hoarding umbrellas—everything is a monthly payment. Spending $500 a month on a fun car that changes maybe a couple times a year is possibly the best use of money that I can think of. Because it’s not necessarily a real payment, I make a mental note that I’m pulling in roughly $500 less than I really am each month to account for the fact that I will be losing approximately this much (sometimes more, sometimes less), with the constant car-swapping that I’m involved with. Also, I find that driving exciting cars might even save me some money. Anytime I feel the impulse to buy something like a pool table, an umbrella or a life-size sculpture of a horse—and I got a nice one I’ve had my eye on for a while, let me tell you—I just take my car out for a spin instead. And then I find that the desire to jam pack my house with meaningless physical items is completely gone. But, of course, constantly selling a car and buying another one at a great price is not easy. It can be trying at times requiring you to practice transcendental meditation and listening to Tony Robbins audiobooks to keep yourself from going insane. But, when you do finally get a hold of that new used car, all that pain is so worth it. I’m not sure what will be next after the M5. Maybe a CTS-V? A 911? Or even a Pontiac Aztec? I suppose it will come down to finding that great deal. But in the meantime, I plan on squeezing every bit of fun out of the warrantied M5. I have a feeling this will be one of the best cars that I’ll own—until I buy the Aztec.